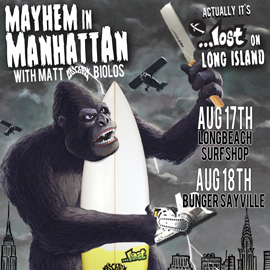 Matt “Mayhem” Biolos will be touring through New York and New Jersey from August 14th through August 18th. He’ll be designing custom …Lost surfboard orders at each stop on the tour. In addition we’ll be showing a special, never before seen, 10 minute teaser of Mason Ho’s new surf flick. Be the first to see Mason’s latest clips… long before the web surfers see ’em. Also special one day only pricing on both custom and stock …Lost boards. Food/Drink and plenty of fee …Lost gear. More info coming but you can check the dates below.